This is the very best ever Paleo chimichurri sauce recipe that exists in the whole world and it is super, super easy to make. 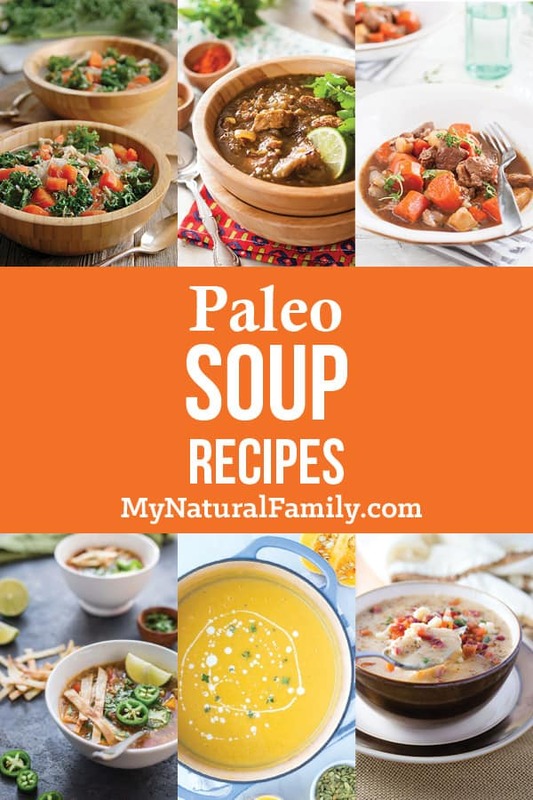 In our family we make grass-fed crock pot pork roast a lot but since my husband eats no sugar and I eat very little (mostly honey or maple syrup), bbq sauce – even a paleo bbq sauce – isn’t a good option for us. 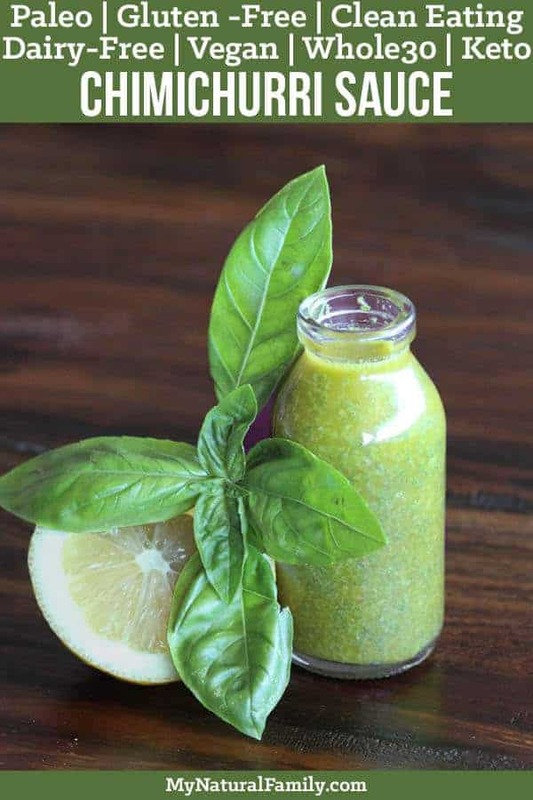 Then I remembered how I used to make an awesome Paleo chimichurri sauce recipe but got out of the habit of it and I don’t know why because it’s an awesome paleo chimichurri sauce. 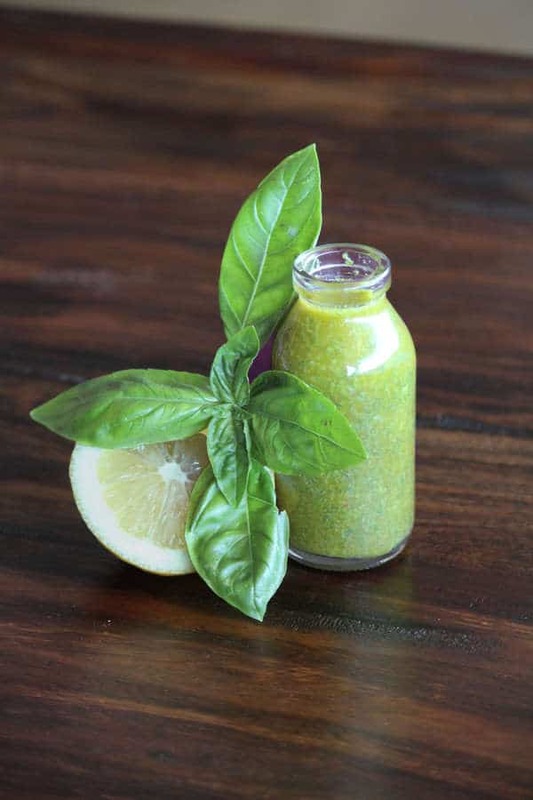 My front yard is full of overgrown basil so I whipped up this sauce in a few minutes. It’s so pretty and SO GOOD! I’m not kidding. My 8-year-old daughter ate a ton of it (my other children wouldn’t even try it). My husband said this sauce is so good he would drink it! I think I would too. I prefer basil in it but the traditional way of making it is with parsley. So if you can’t get basil for a good price, just get a bunch of parsley for really cheap at the grocery store. Since I wrote this post I have decided that I really like this made with cilantro too. You should try all of them, basil, cilantro, and parsley and see which you prefer. To tell the truth I can’t tell a whole lot of difference. Why do I like this paleo chimichurri sauce so much? It’s fresh, light and flavorful. 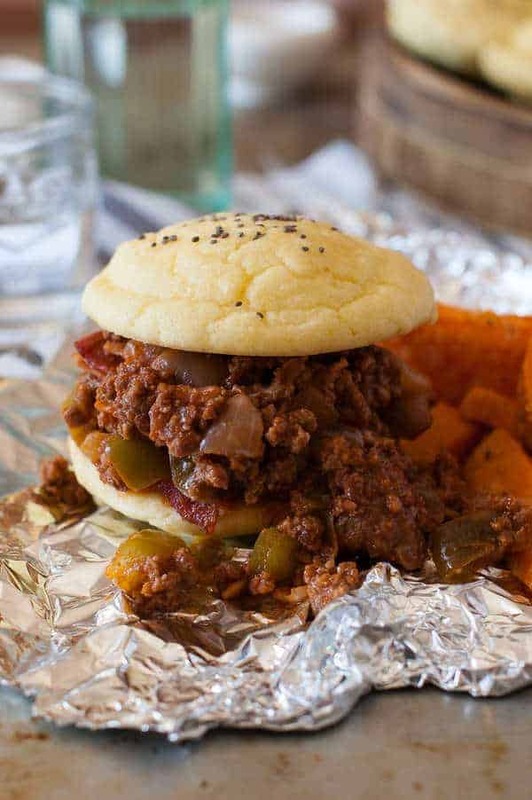 It has a bright color and flavor and turns ordinary meat into something really delicious. I love the tang of the lemon juice with the zip of the garlic and the flavor of the fresh herbs. Try the sauce then let me know how you’ve used it and give us all some great ideas. It’s delicious on steak, Churrasco meat, fish and chicken and – Oh! I bet this would be amazing on eggs. . . Heck, I’ll eat it on anything! This is a delicious-savory sauce to put on any meat, seafood, eggs – the possibilities are endless! Chimichurri Sauce is has no sugar added nor honey. It’s fresh, light and flavorful with a bright color and flavor that turns ordinary meat into something really delicious. there is a beautiful tang from the lemon juice with the zip from the garlic and the flavor of the fresh herbs. Try it and love it! Blend until the basil pieces are small and even. Drizzle on your favorite meat, seafood, eggs – the possibilities are endless! Thanks! I’m glad you like it. We definitely make it a lot around here. I absolutely love this, I made some yesterday. I don’t think I could make too much of this. I just poured a whole batch on my roast. It makes the potatoes and carrots taste lot better too. I often forget that sauces are a thing! But this would be a lovely addition to just about any dish. I feel like this would elevate a dinner and make it feel special, without requiring a whole lot of fancy preparation. Lovely ingredient list! I’m from Australia, do you know what would be the equivalent of the Zip here? I know I could purchase from Amazon but they are out of supplies. I can’t eat any store bought sauces, my gut won’t tolerate them, so anything I can make from scratch is very welcome. The main ingredient in The Zip is paprika. Hopefully that helps . . . It is an awesome blend of spices under the Spice Hunter brand name. Just click on the link on the post and you can see it on Amazon. It’s the best price I’ve found it anywhere. Much less than local stores. Hi Rebecca, thank you for your blog, it is very inspiring. I was just reading this recipe and it sounds yummy. However, is not quite correct. I was born and grew up in Argentina, home of the Chimichurri! So I thought you may want the real recipe, here it is. Kindest regards, Silvia. Note: it can be kept, in the fridge, indefinitely. Wow! This recipe sounds awesome. Thanks for sharing! I know mine it’s authentic (I have a brother-in-law that is from Argentina) so I should probably call my sauce something different but the closest thing I know to it is Chimichurri. I will definitely have to try this though!